Best Carry On Backpacks 2019: Rated + Reviewed – The Discoveries Of. Planning on travelling but want to avoid the fees and the fuss? The perfect carry on backpack is a practical piece of travel gear and a convenient way of lightening the load. We’ve rated and reviewed the best carry on backpacks to help you plan the perfect trip. eBags TLS Mother Lode Weekender Convertible backpack is an excellent carry on backpack with plenty of space: the perfect combination. eBags are known for their excellent customer-led designs, and the TLS Mother Lode Weekender is no different. What’s more, it comes in a wide variety of eight colours – suitable for even the fussiest traveler. Despite its name, the backpack features a spacious main compartment that can easily fit a week’s worth of travel items. When it comes to organisation, the TLS Mother Lode Weekender Convertible is the perfect carry on backpack. Not only does it have a handy and safe laptop compartment, there are a number of dividers and straps to hold your items in place on those bumpy journeys. If you want to further organise your pack, the TLS Mother Lode Weekender is fully compatible with eBag’s large range of packing cubes. Read my full review of eBags packing cubes now. We particularly like the ease of portability of the TLS Mother Lode Weekender. With handles at the top and side, you can carry it like a duffle bag as well as use it as a backpack. It also comes with a handy adjustable shoulder strap. The expansion zipper is a great option. Particularly if you have a tendency to overpack your bags. Just be sure to check that the bag will still fit into your airline’s carry on dimensions once expanded. Overall, the eBags TLS Mother Lode Weekender Convertible is a great all-rounder at a reasonable price. Deuter Transit 40 is ideal for those longer international trips, which is why we’ve chosen it as the best carry on backpack for international travel. The combination of the lightweight pack, great suspension and ventilated air straps means that it’s a perfect travel bag. Ease of portability was clearly at the top of Deuter’s list when they created this bag. The Deuter Transit’s lightweight body makes it a lot easier to carry items in for long periods of time. Anyone who’s ever had to lug around a weirdly weighted pack will be thankful for the Transit’s robust suspension carry system. There are hip straps with soft foam hip fins, to take the weight off your shoulders. The ventilated air straps are a real blessing when it comes to keeping cool in hot climates. They also go a significant way to helping prevent huge sweat patches under your straps (we’ve all been there, it’s not a good look). The Deuter Transit features a large, roomy compartment that opens all the way – no awkward top-loading backpacks here. Inside, you’ll find compression straps to keep the contents stable. Blown away? Here’s the cool part: the secondary compartment. This doubles up as a smaller detachable bag, so you can head out and explore the city without lugging around a large backpack. Come time to board the plane, you can tuck away the Deuter Transit’s suspension system to make it compact and easy to put in an overhead locker. You can even fit it under the seat in a real squeeze. In summary, the Deuter Transit is a comfortable and lightweight pack that is ideal for international travel. Much as we all love a backpack for their easy portability, there are times when we’d all prefer not to be lugging our lives on our back right? High Sierra AT3 is the best carry on wheeled backpack we’ve tried. This three-in-one option is a backpack, daypack and a wheeled bag – practical for pretty much every situation. I’m a big believer in front-loading backpacks, after having struggled with top loading ones for far too long. You’ll never understand the difficulty of finding a pair of socks until you have to pull out every single item from the tiny opening in the top of your pack to find them. No such problems with the High Sierra AT3. The main compartment of the bag opens up fully allowing easy access to your items. It also features securing straps to ensure the contents of your bag are held in place. The padded shoulder straps ensure comfort, even over long periods of time. The High Sierra AT3 also features a retractable handle and separate side handles to make it easier to lift the luggage whilst your travelling. If you’re planning on roughing it, this backpack can withstand the elements with its strong, durable and sturdy wheels. So what’s the downside? While the High Sierra AT3 may be strong, it’s also a little heavy. Not ideal if you are trying to pack as light as possible. There have also been complaints of faulty zippers breaking very easily, though this isn’t something that we have experienced ourselves. Overall, the High Sierra AT3 is the best carry on backpack with wheels and a great alternative to give your back a rest while you are on the road. Sometimes it’s important to stay true to our old pal Baloo and stick to the bare necessities. On some trips, there’s just no need for those extra five tops that may never get worn. Gonex Ultra Lightweight Backpack is the best minimalist travel backpack. The 20 litre capacity is ideal for days out and short trips, or for those searching for an affordable minimalist travel backpack. At 20l, you are going to have to be a packing ninja to use this as an overnight bag. It’s tough but totally possible. Whilst it may be small, the Gonex Ultra Lightweight Travel Backpack can definitely hold its own. The tear and water-resistant nylon material provides durability and protection from the elements. It’s even abrasion resistant. The backpack features three compartments. You need to be super organised when you are travelling light, and there’s enough bells and whistles on the Gonex to help you do just that. Laptops might be a problem as there’s no padding or protection within the bag – not necessarily the best option for pricey electrical gear. The true benefit of this backpack is the fact that it’s extremely lightweight and can be packed away really easily if you need to fold it up and store it anywhere. The Gonex Ultra Lightweight Travel Backpack backpack comes in an array of colours so there’ll be no issue in finding one that suits your taste. It may be the best minimalist travel backpack but you can buy it in some pretty flashy colours. Minimalist doesn’t have to mean understated after all. Patagonia Black Hole Backpack is the best ultralight travel backpack if you’re keen to keep the weight down on your pack but want something a little larger than the Gonex we talked about above. At 32l, it fits relatively comfortably under your seat – so also wins the gong for the best underseat carry on backpack if you’re on a longer trip. The bag itself weighs around 850g and is made from extremely lightweight material. The Patagonia Black Hole is a great backpack for adventurers as its water-resistant exterior protects your contents from extreme weather and also gives it a lovely, shiny finish. What’s more, the tough exterior, made from polyester ripstop material is also pretty resistant to wear and tear due to its strong fibres. Inside the backpack, the Patagonia Black Hole features a protective laptop sleeve as well as plenty of other spacious compartments. Comfort is key with this backpack. As well as padded shoulder straps, it boasts a back panel for cool airflow and an easy securing waistband. Patagonia as a brand is very environmentally aware, and their products are always made to the highest standard. Eco-friendly, high-quality and comfortable. What more can you ask for? Overall, we’ve chosen the Patagonia Black Hole Backpack as the best ultralight backpack. It’s certainly an excellent choice for lightweight and comfortable travel. Check prices and availability on Amazon. AmazonBasics Carry on Travel Backpack is anything but. This affordable carry on backpack provides you with all the basic fundamentals you need from a backpack at a reasonable price. Great. But what’s really special is that it doesn’t skimp on quality. Look, we’ll level with you. This may not be the most stylish carry on backpack, but it’s extremely practical with plenty of capacity and comfort. Inside, the AmazonBasics Carry On features a front pocket, a large main compartment and a laptop sleeve. Pretty much all you need to get you on the road. This backpack is also flexible and made from lightweight material, making it very wearable. The material used may not be as durable as some of the pricier ones on the market, but it definitely does the job for shorter trips where you’re not planning on putting it through its paces. Overall, the AmazonBasics Carry on Travel Backpack is a great budget carry on backpack and a reasonable alternative to the more expensive backpacks around. Osprey Farpoint 40 is a long-time favourite of ours here at The Discoveries Of and gets our vote as the best 40l backpack any and every day. The Farpoint 40 backpack is great for anyone wanting to explore the great outdoors as it has the space, durability and comfort that you’ll need whilst on the road. Even if you aren’t planning on adventuring much, it’s a close contender for the overall title of best carry on travel backpack thanks to its superior comfort and durability. The Osprey Farpoint 40 has a nifty featured known as a LightWire Frame Suspension which allows the weight to be transferred from your harness to your hip belt, taking a huge load off your shoulders. One of the most irritating things when backpacking is having loose straps flying all over the place. The last thing you need when exerting yourself is to be tangled in your backpack straps. Tangled backpack straps are the bane of many a backpacker’s life and Osprey are well aware of this. That’s why the Farpoint 40 features a storage compartment to stash loose straps and buckles when you’re not using them. The Farpoint boasts a roomy main compartment, which opens like a suitcase, making packing easier. It also has lockable sliders to keep your belongings safe. These backpacks are designed to withstand rough travel so feel free to release your inner Bear Grylls! Even so, it’s surprisingly lightweight, Osprey’s lightest backpack in fact. 40l is the largest carry on backpack size that you can get away with on most airlines, so the Farpoint 40 is a great choice if you are travelling for a longer period of time but don’t want the hassle (or the cost) of checking in bags. Though it’s not strictly a carry on backpack alone, I couldn’t write this review without including the versatile Standard Luggage Co. Carry On Bag. A backpack, holdall and cross-body all in one, it’s a great option for those who are looking for a smart option for their travels but don’t want to sacrifice the easy portability of a backpack. Size-wise, it’s pitched perfectly to bring as carry on luggage on all airlines – nothing new there. What really makes the Standard Luggage Co. Carry On Bag stand out is the thought and attention to detail that has gone into each bag. The bag is split into two main compartments – a larger front one is perfect for carrying up to a week’s worth of clothes and comes with extra storage pockets and compression straps. The back compartment features a detachable laptop case (perfect for whizzing through airport security), and lots more handy pockets for you to store objects (in my case cables and plugs) of all shapes and sizes. Read my full review of the Standard Luggage Co. Carry On Backpack. The best carry on backpacks are not necessarily the biggest ones, but the ones with the most practical storage space. By having things compartmentalised and well organised, you can pack your belongings practically (and ultimately fit more in). It’s a real pain to have to dig things out from the bottom of your bag. Our advice is to go for one that opens at the front. It’ll save you diving head first into your backpack and getting lost amongst the dirty socks. If you plan on working or just generally using your laptop, it’s best to consider a bag with a laptop compartment. Most bags can accommodate a laptop but that doesn’t ensure it’s protection. Wherever you go in the world, there’ll always be some bad eggs trying to nab you stuff so make sure your contents are protected. Look out for slash proof material and lockable zips. Going on a trip? 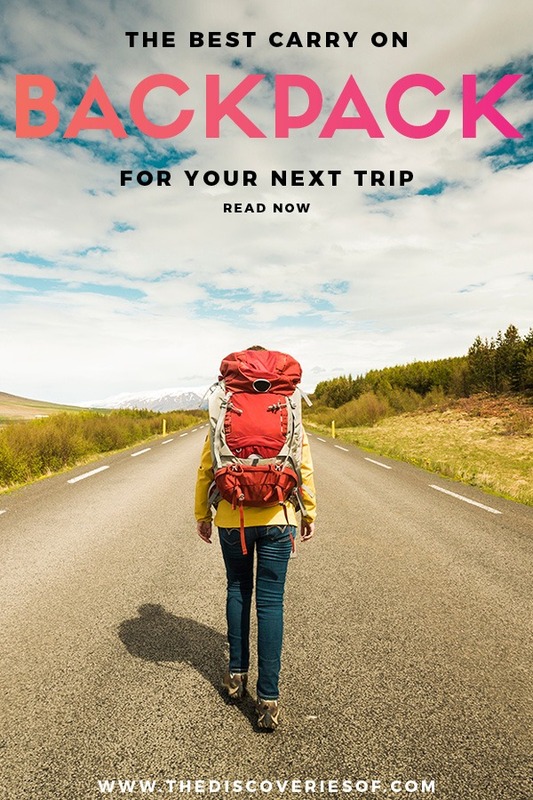 You might also find these travel gear guides and reviews handy.